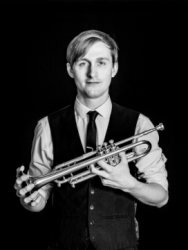 I am a friendly drum and trumpet tutor teaching in the Cambridge area. I have a wide playing experience from classical ensembles, orchestras, cuban big bands, ska bands, function bands, tribute bands and klezmer bands along with my work as a studio session musician and of course an instrument tutor. Over the years my interest in the challenges of playing have lead me to investigate very thoroughly the techniques and physical difficulties of playing the instruments which are numerous yet solvable when approached in an informed and calm manner. My oldest pupil is in his fifties, I am happy to take trumpet pupils of any age provided that they have their front four adult teeth - this does not apply to drum students. I currently teach at two schools, Comberton VC and Cambourne VC, term time students totaling circa 47 per week. I use a variety of methods to achieve pupil's understanding, method books, mental images, and demonstrations. I can be flexible with timings, even on a week to week basis if finding a steady slot can be difficult. I have a teaching space at my home, travelling can prove expensive so I recommend coming to me. I teach the trumpet as an instrument not a genre; much of the technique I pass over is based in the classical style as I find this creates players who can perform with ease but I also teach my pupils to improvise, to play from memory, music theory and even some composition while they master the instrument itself. I find this produces well rounded players who can apply themselves to almost any situation. This holistic style of education encompasses classical, pop, funk, klezmer, cuban and more. I set my students up with the technique, skills and knowledge they need to apply themselves to almost any style of playing. Starting with a solid technical routine my pupil's build up their skills in directions which interest them. I can travel to lessons but be aware that this oftern makes the price of each lesson quite expensive. If pupils wish to take grades on ABRSM or Trinity I can facilitate this, however, I do not believe that attaining grades is positive for all pupils, helpful as it can be within the wider education system. As a drum tutor I present a rather different set of ideas, still based in good solid technique and theory but much more based in popular music; I do not teach classical percussion as I am not myself a percussionist. I draw from my extensive background in band playing to initially provide students with the select tools they need to get out playing with other musicians; we then work on deepening their knowledge and expending their tools to tackle much more taxing obstacles. Much of the work that will be needed to be completed at home can be done on a practice pad though access to a drum kit will be needed in some shape or form, especially if the pupil is to remain engaged and driven (be this acoustic or electric). JakeFrom Noah (5/5): Jake is an excellent trumpet teacher! In the short amount of time that I have been learning with Jake, my ability and range on the trumpet have increased so much more than I ever expected. He is very good at helping you grasp difficult concepts by painting word pictures, as a lot of trumpet technique is very subtle and hard to describe. I have thoroughly enjoyed all of my lessons, and would recommend Jake to anyone at any stage of learning the trumpet! His tone is also incredible, and something to strive for!! Reply from: Jake: It has been a pleasure teaching Noah, his success is for the most part due to his commitment to practise and personal improvement. I can only hope that this arrangement continues as it has begun, I have little doubt that it will!